How many ports does a smartphone actually need? The charging port of course. We like to see a data port. And one can't forget the headphone jack! In the past, some smartphones had a mini or micro HDMI port. Now there are rumors about a daring project: Apple wants to get rid of the Lightning connection. Its replacement? Nothing. Here's some old drinking wisdom I subscribe to: no port is not a solution. Anyone who has taken a look at the smartphone market lately won't be able to shake the sense that something is off. Smartphones that cost many hundreds of dollars seem to be pranking us. Non-removable batteries drive up repair costs. Glass backs scratch when you look at them. Then, even after paying all that money, there's no headphone jack in some of these high-end flagships. Now, it's true that putting a 3.5-mm headphone jack in a smartphone that's thin is a tough job. 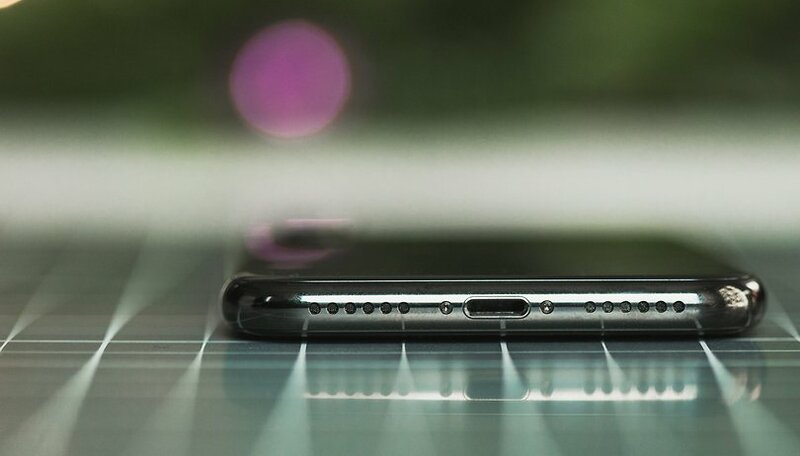 I don't think many users would mind getting a 1 to 2-mm thicker smartphone to be able to keep a headphone jack, but manufacturers aren't taking any chances. So, away it goes. For current iPhones, Lightning is the last connector. For two or three years, industry analysts have speculated about when Apple would exchange the Lightning connector for USB Type-C. I have always considered that unlikely: why should Apple give up the proprietary Lightning business? Why adopt the technically worse solution? Especially since USB Type-C is a bit bigger and would eventually demand a thicker iPhone? Yes, yes, with the Macbook, Apple has almost single-handedly pushed USB Type-C into the market, according to the legend. But what does this have to do with the iPhone? Nothing. For Android smartphones USB Type-C was inevitable anyway. On the other hand, there is no compelling connection between USB Type-C on the Mac and USB-C on the iPhone, as USB-C-on-Lightning cables prove. Now we are in for some spectacular rumors. Apple may get rid of the Lightning port and replace it with nothing at all. No more data port for the iPhone. Allegedly, Google may also be thinking about it for the Pixel smartphones. For this year, the topic might not be relevant yet, but next year we could see the first port-free, totally wireless smartphones. And why not? Wireless charging is fast enough today to make the charging cable redundant. In case of emergency, there is just a smart connector with a magnetic connection and specialized charging pins. Data can be exchanged via Wi-Fi. In any case, I go about my everyday life with my smartphone completely wirelessly, and for many it will be similar. To lose all connectors is a bit nuts though. After all, ditching the ports isn't addressing any actual problem. Cost won't be any matter in the high-end segment. Of course, a port-free and buttonless smartphone can be sealed against water more easily. What will customers think if the iPhone became even more expensive? I can already hear the cry: "How could you?!". And it is true: For the smartphones in the $900+ range, meaningful connections are an obsolete model. On the other hand, practical features remain with cheap smartphones: headphone jack? It's still there. Memory card slot? Check. Dual-SIM? Yep! Micro USB port? How is it supposed to go without it? It's a bit strange: The high-end smartphones are becoming increasingly impractical and expensive. The cheap smartphones, however, always getting better and more practical. Already today it is probably more sensible for most users to buy a cheap mid-range smartphone than a high-end smartphone. Usually the mid-range smartphones are just as good, and can even be more robust. What more could you ask for? Are you aware of the disappearance of features in high-end smartphones, which can still be found in the mid-range? Or, does the camera keep you trapped in the high-end? This article is solely the author's opinion, and doesn't claim to reflect the views of AndroidPIT as a company or its other editors. In the past i had a nokia n8, galaxy s3, and now lg g4, all of them had everything from removable battery to hdmi output via mhl or slimport or even a mini hdmi port on the n8, and now it's impossible to find a flagship with hdmi support, the mate 10 and s9 exynos have weaker gpus and the only ones that have hdmi output, the v30 has it so i was hoping for the lg g7, but lg decided to remove hdmi support, the zenfone 5z looks like the one but no hdmi either, the u12+ no audio jack and it's impossible to find if support hdmi output or not, since reviews never care and center in stupid things that power users don't care. What's with non removable batteries?? It's ridiculous my g4 and galaxy s3 are still rocking thanks to that option with brand new batteries, but the brands don't want that! They want programmed obsolescence. Today's smart phones have become very smart. I am so smart that Intelligence has already begun to grow. But that's another story. A truly "smart" phone is the one that is wireless in full: we have wireless charge, we have wireless audio headphones, we have wireless internet connection, then we can bind the phone to a TV, also with wireless mode, we can wireles all the phone does some tasks, that is, we do not need to touch it (!) but only to say the necessary orders, at the store we can pay only with the phone, without the need for a separate card, and so without (the NFC function), we only have the screen to look at, and we do not need to be that big anymore (we have a TV, do not?). Because we have "wireless" there is no need of Gauri !!! I mean, the loading hole, the hole in the headphones, or the microSD card, even for SIM cards, does not need the ... hole! Hurray !! And so, small intelligent devices slowly turn into technological thumbnails to make our life happier. Really ?! "Or, does the camera keep you trapped in the high-end? " Honestly, I'd prefer a phone with no camera at all, but the only ones like that lose all the rest of the smartphone capabilities. The Jitterbug flip phone for example. Give me a decent mid-range phone with the full online and app capabilities then remove the camera plus all the related camera software, I bet that could make it a lot less expensive. On the port side of things, I have never met anyone who dropped their phone into a pool or pot of standing water completely submerging it for an extended period of time. But I do know many people who used their phones in the rain or spilled on them. I truly don't understand the desire to waterproof a phone. It seems as wasteful to design such a phone as that commercial where the rapper is constantly pouring champagne on his phone while using it for calls. If anyone wants their phone to be waterproof they can buy a sealed case anyway. (start semi-sarcastic paranoid rant mode) But since bluetooth kills batteries faster and companies want our non-replaceable batteries to die so they can force us to buy a new phone, it makes sense they want us to use bluetooth too (/end rant mode). I prefer a WIRED connection for my phone when transfering data to/from my computer to the phone. 1/2 the time, the wireless link fails, or something interferes with it. Honestly smartphones are getting impractical and hard to use. They took away the 3.5mm jack without a second thought, but a lot of people are still using regular headphones. They want to take away the charging port but than external batteries would become obsolete and your phone would die sooner because you can't charge it on the go. Another big problem is displays, they are getting way too big to use them. 6.4 inch phones, are you kidding me. if you want a phone with a 5-5.5 inch display you have to buy a low end phone which is only half decent if usable at all. I would love a at least mid range phone with decent hardware and a screen of 5.2-5.3 inches, its a phone for gods love not a pocket TV or a tablet. If i would like something like that i would buy something like that. But the phone giants think otherwise so we got no other choice. There is no such thing as wireless charging because the charger still has to be plugged in. There are still wires involved, plus it uses more power. You are more apt to grab the phone and leave the charge plugged in than the hard wired type. In my opinion. I charge my battery separately from my phone so in a since I am wirelessly charging too. 0 to 100% in just a minute. lol dude, are you seriously gonna spam every single article with your nonsense about removable batteries? at what point do you stop shouting in the dark and get with the times? this isn't coming back. ever. I will keep doing it because I am not sheep like you that will buy what ever I am offered instead of what I want. As long as people accept planed obsolescence you are right it will not come back. If people will stand up for their rights and what they want maybe it will. Wireless charging may be good but I bet when you buy the phone the charger will be extra! "I go about my everyday life with my smartphone completely wirelessly" good for you if you live in an area with good a electrical grid. Have to say, I think a lot of this is OEM exploitation of the nearly mindless telco renewal model of smartphone purchases - consumers are in the habit of simply getting the latest new model of whatever device they now have whenever the telco contract turns over - full stop. Enthusiast readers of tech mags are a minority. The monthly cost of new phones to current monthly bills, and the annoyance of changes like "your old wired headphones just aren't good any more" are minor speedbumps in most users' daily lives. Give me ports and lots of them. Speed, security, flexibility, compatibility. I want more ports than just one even. And uSD support, and a phone that opens so I can replace things. I like flexibility and control.